Kusuri Kolor Food is latest addition to be added to the Kusuri food range. 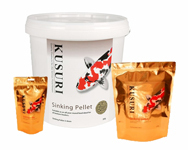 Especially formulated to improve the depth and colour of your Koi, Kusuri have added Paprika and Spirulina to this high palatable, low waste food. Guaranteed to improve the beauty of your Koi. Kusuri Kolor Food is a 6mm floating food contains the highest quality proteins and ingredients to improve colour. Kusuri Kolor is specially formulated with Paprika and Spirulina to naturally promote excellent colour depth in your Koi. With Wheatgerm, Soya and fish meals, this 35% protein food can be fed down to 10°C. At Higher temperatures above 20°C this food can be mixed with other foods from the Kusuri range to maximise and promote good growth as well as colour. Limestone Flower, E1 Iron 40mg, E2 Iodine 2mg, E4 Copper 5mg, E5 Manganese 15mg, E6 Zinc 100mg, E310 Propyl, Gallate 9mg, E320 BHA 9mg, E321 BHT 294mg, E371 Vitamin D3 4500IU, E372 Vitamin A 6000IU. Ref: KUPR A very high quality, highly medicinal, immune enhancing, floating food for Koi. Included are the immune and health enhancing properties of propolis, garlic and brewers yeast. Kusuri Premium (FPF-1) is formulated for low waste and low nitrogenous output, as well as high growth, with natural chemical free colour enhancement. Also included is a generous amount of wheatgerm, along with the improved nutrient assimilation properties of Kusuri Klay. Protein 37%, Oil 6%, Fibre 3.2%, Ash 9.7%, Moisture 10%. Ref: KUPRM A very high quality, highly medicinal, immune enhancing floating food for Koi, based on our hugely successful Premium range; but designed specifically for smaller koi. We advise no minimum feeding temperature, although we do thoroughly recommend that feeding is dramatically reduced below 10°C (50°F). Fish meal, Shrimp meal, Antarctic Krill meal, Crab meal, Soya bean meal, Wheatgerm, Kelp, Propolis, Spirulina, Kusuri Klay, Garlic, Brewers yeast, Fish oil, Vitamin A, Vitamin D, Stabilised Vitamin C, Vitamin E, Dicalcium Phosphate, Choline Chloride, Niacin, Riboflavin (Vit B2), Pyridoxine (Vit B6), Thiamine (Vit B1), Calcium Pantothenate, Biotin (Vit H), Folic Acid, Cobalamin (Vit B12), Inositol, Minerals (Magnesium, Zinc, Selenium, Manganese, Copper, Iron). Ref: KUSGP Super Growth is a high protein (63.4%) special formulation paste food, and when fed to your Koi in conjunction with good water conditions will produce superb growth. The high protein level of this food, when digested by Koi, is reduced down into constituent amino acids that will produce better muscular growth and provide further energy. This high protein food is beneficial when fed to Koi at temperatures above 20°C (68°F). Do not overfeed! We recommend a feeding rate of half the volume of any previous pelleted diet. 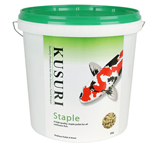 Kusuri Super Growth paste food comes as a powder, and when mixed with water makes a dough consistency to be fed directly to your koi. As this food has not been processed by heating and cooking, none of the valuable nutrients are lost. The maximum recommended life of the mixed product (dough) is 3 days, provided it is refrigerated. Super Growth paste food will also show marked reduction in fish waste material, aiding water parameters. 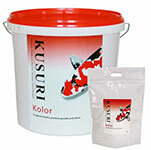 The high quality white fish meal in this product will also improve the base white pigmentation of the Koi. Our high protein paste food has been formulated to provide highly effective growth potential through the summer months, and should only be used at this time of year, or in a temperature controlled system. White "LT" fishmeal, Wheat Meal proteins, Niacin, Kelp, Vitamins A,B,D,E,K, Stabilized Vitamin C, Kusuri Klay, Brewers yeast, Minerals, Spirulina, Antioxidant. Basic Analysis: Crude protein 63.4%, Oil 8.1%, Ash 8.69%, Fibre 0.69%. Ref: KUGR Following on from years of research, Kusuri have developed new Growth food. 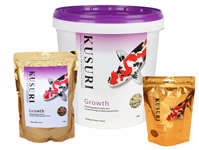 Kusuri Growth food contains the highest quality proteins to promote rapid growth, without the risk of any build up of fat deposits inside the body of the fish. 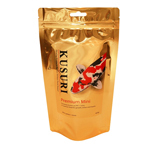 As with all of the Kusuri food range, the primary consideration was to produce a natural dietary pellet for Koi. We have developed a precise blend of lipids and other vital nutritional ingredients to promote both rapid growth and good body shape. For best results, this high protein food should be fed when the water temperature is above 20°C. Small volumes of food throughout the day is the preferred method of promoting the potential for maximum growth, whilst maintaining water quality. 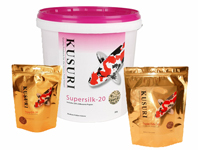 When feeding larger Koi (3 years and older), Kusuri Growth food can be mixed with Premium, Multiseason or Supersilk-20 for best results. Ref: KUMS The most versatile of Kusuri foods, rapidly gaining a deserved reputation for amazingly low waste from your fish. Wheat flour is a major carbohydrate constituent in many pelleted foods, and is almost impossible for the Koi to digest. This food has been specifically formulated to remove all wheat flour, allowing greater pellet digestibility at various temperatures. We have formulated Multiseason specifically for Northern Hemisphere temperatures so it can be fed conveniently as a pellet food, without any residue on pond water. Containing Kusuri Klay, 'Optimum' food enhancer and pre-biotics, Multiseason is a very special recipe acknowledged as having the ultimate ingredients for feeding to produce excellent growth and colour improvements in koi. You will discover that feeding little and often will produce very low levels of fish waste. 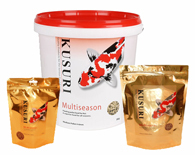 Multiseason can be mixed with any of the other foods in the Kusuri range. 18°C to 20°C Lightly feed 2-4 times daily. 13°C to 15°C Reduce light feeding to once or twice a day. 11°C to 12°C Once or twice per week. Fish meal, Shrimp meal, Antarctic Krill meal, Soya bean meal, Wheat germ, Kelp, Spirulina, Kusuri Klay, Garlic, Brewers yeast, Fish oil, Prebiotics, Optimum, Vitamin A, Vitamin D, Stabilised Vitamin C, Vitamin E, Vitamin K, Niacin, Riboflavin (Vit B2), Pyridoxine (Vit B6), Thiamine (Vit B1), Biotin (Vit H), Folic Acid, Cobalamin (Vit B12), Calcium Pantothenate, Dicalcium Phosphate, Inositol, Selenium, Antioxidant, Choline Chloride, Nicotinic Acid, Methionine, Lysine, Magnesium, Zinc, Selenium, Manganese, Copper, Iron. Protein 38%, Oil 8.5%, Fibre 2%, Ash 9%, Moisture 8%. Ref: KUST Kusuri Staple is a high quality floating pellet food, containing all of the necessary ingredients for healthy coldwater fish. 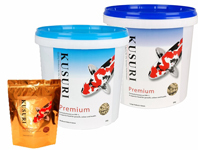 This food can be mixed with any of the Kusuri food range, to vary your fishes' diet. Feed sparingly below 10°C (50°F). Only feed what is consumed within 10 minutes, removing any uneaten pellets after this time elapses to avoid polluting the water. Ref: KUWG Kusuri Wheatgerm has been especially formulated, now with increased garlic and wheatflour free, to aid digestibility. This wheatgerm formula contains the high nutrient ingredients included in the Premium formula, such as krill, kelp, garlic, propolis and optimum. Wheatgerm feeds can of course be fed at any time, but are particularly popular during autumn, winter and early spring periods when pond water temperatures are low and a reduced feeding protocol is usually adopted. With this in mind, Kusuri Wheatgerm has been deliberately developed to include a very high level of vitamins, minerals and other direct medicinal inclusions. One of these is called 'Optimum'- a proven natural additive that stimulates resistance to disease infection, and helps promote tissue cell growth. Crude Protein 34%, Oil 4%, Fibre 6%, Ash 9%. 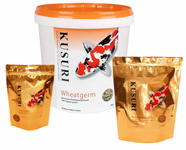 The new 34% protein level of Kusuri Wheatgerm is manufactured in the UK in medium (4 - 6mm) and large (8 -10mm) pellets. Ref: KUSP Kusuri Sinking Pellet is an all seasons formula, and is suitable for a wide variety of bottom feeding pond fish, including Catfish, Sterlets, Tench, Goldfish, Sturgeon etc. 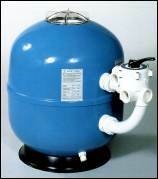 Sinking Pellet formula provides a full everyday diet deriving proteins from fish meal and from vegetable origins. A balanced Vitamin and Mineral supplement which will meet all the needs for good growth, whilst maintaining optimum health and vitality. Kusuri sinking food also contains a number of special ingredients to promote health and help reduce stress. These ingredients include purified Beta 1,3/1,6 glucans, which is an immuno-stimulant enhancing production of white cells to kill off invading bacteria. Extra Selenium and Nucleotides are also included to help reduce metabolic stress. Soya bean, Fish meal, Wheat, Fish oil, Maize gluten, Yeast extracts, Calcium Carbonate, Dicalcium Phosphate, Salt, Calcium Phosphate, Betaine, Sodium Propionate, Vitamin A, Vitamin D, Vitamin E, Phosphorus, Copper, Selenium, permitted Antioxidants. Protein 30%, Oil 10%, Ash 15%, Fibre 6%, Moisture 7%. Ref: KUSS Supersilk-20 is a very special recipe including 20% Silkworm Pupae. Silkworm protein is acknowledged by Japanese breeders as the ultimate ingredient for feeding and for colour improvement of Koi, Silkworm pupae have a unique type of protein and silk oil properties that koi can digest easily. With all of the Premium food properties, plus added Silkworm pupae ingredients, this food is ideal for any koi pond. With 38% protein properties we advise feeding down to 15°C with no adverse effects, and reduced down to little feeding at 12°C. Supersilk-20 can be mixed with Multiseason for minimal waste, superb growth, and excellent colour enhancement for your koi. Silkworm pupae, Fish meal, Shrimp meal, Antarctic krill, Soya, Wheatgerm, Kelp, Propolis, Spirulina, Kusuri Klay, Garlic, Brewers yeast, Fish oil and Optimum, Vitamin A, Vitamin D, stabilised Vitamin C, Vitamin K, Niacin, Riboflavin (Vit B2), Pyridoxine (Vit B6), Thiamine (Vit B1), Biotin (Vit H), Folic acid, Cobalamin (Vit B12), Calcium Panothenate (Vit B6), Dicalcium Phosphate, Inositol, Selenium, Antioxidant, Choline Chloride, Nicotinic Acid, Methionine, Lysine, Magnesium, Zinc, Copper, Iron. Protein 38%, Oil 8%, Fibre 4%, Ash 14%, Moisture 8%. Ref: KUSPU Fed as a high protein food 'treat', these dried silkworm pupae are high in silk protein which enhances colour distinction and vibrancy.